March | 2012 | Occupy, Catholics! Last week, I was in Berkeley, California, for the Occupy Faith National Gathering, coordinated by theInterfaith Tent at Occupy Oakland. I was one of six from Occupy Faith NYC/Occupy Wall Street, and our delegation was a small part of over 60 conference participants from some fourteen Occupations around the United States. Christian-identified participants were the overwhelming majority, and there were also Jewish, Muslim, Native American, Buddhist, and Wiccan-identified participants, and more, including multiply-identified persons. We also convened an interfaith service at Occupy Oakland. The whole conference was generously facilitated by theologian and activist Dr. Rita Nakashima Brock. Over the course of a couple of days, we traded stories of experiencing and supporting our local Occupy sites, and caucused with the aim of planning some coordinated national Occupy Faith activities for the rest of the year. I will write more about those as they come into public view in the coming months. The Occupy movement has often fallen off the front pages over the winter months, due to the many evictions from Occupy sites, but due also to Occupy’s quieter work of advocacy and solidarity with workers, with people stuck in the underclass, with families displaced by foreclosures, with students, and much more — work that is not the flashy stuff of major media news coverage. But a big spring of events is coming, indeed is already underway. For regular updates on the works of Occupy, see the InterOccupy site. The Occupy Wall Street page is here, Facebook here. The Occupy Faith NYC page is here. Of particular interest to many America readers, Occupy Catholics are here. In this Occupy work, theologically, I am most interested in what actually happens to people’s faith/religion/spirituality when we meet and work with other people of different faiths/religions/spiritualities, in their integrity, working for the common good — and what the implications might be for the way that theology understands the stability and plasticity of faith/religious/spiritual identities… in the interest of learning how to live responsibly, sanely, justly. Jane invites everyone to stay for refreshments afterwards but has to leave to care for an elder member of their community who is sick. Sister Susan (SS) calls the Assembly to order with a prayer she’s written to celebrate the spirit of the Occupation. Loren then explains the use of Occupy hand signals and the assembly bore into group discussion. Ideas: Bible Block- Dressing as biblical characters performing ‘morality plays’ on the street in the city. Discussion: Liz: What are we doing for Holy Week, we should use it to get media exposure. Richie: concerned with Occupy Hands; if we are trying to reach out we may put people off if we interrupt a mass. Nathan: Occupy, Catholics will have actions in concert with Occupy Faith on palm Sunday and with Pax Christi on Good Friday Stations of the Cross Procession. Discussion topics were: Does the movement have a political agenda? What does poverty mean? What is a necessity? Loren: perceptions of Occupy movement mirror voluntary poverty- “being the change” What are the effects of conscious/conspicuous consumption? How the use of social media can be used to raise consciousness. Schools need discuss these issues with kids. There is a violence in supporting the status quo, in allowing the seizing of homes. Black Bloc as a potential way to distract from principles of non-violence. Someone asked what is Black Bloc, Steve explains what Black Bloc is. Social Justice in economic thought is integral to Catholic teaching, but it is not being emphasized we need to ask for a mass at St Patricks Cathedral by either Cardinal Egan or Dolan to celebrate the Labor Encyclical, then have masses said in the local diocese to highlight the issue of social justice. The thought being, if the seat of the diocese leads the local churches will follow. Discussion: Chris: we need to create a dialogue, Occupy is a grass roots movement and we need to push the cause of Social Justice with is being overlooked and ignored even though it is at the core of our Liturgy. A General discussion started where Rick told about police harassment of OWS people; Bill read about an anti-OWS movie; Steve said that movie was being produced by Citizens United; Liz said she is tired of violent patriotism where if you don’t support war you aren’t a good American- non-violence needs to be emphasized. Robin said come to Liberty Plaza with signs and participate, the tourist buses are still telling people about OWS as they pass! Steve said Occupy, Catholics needs all the Catholics of conscious to join us at our planning meeting on March 20th, at the Plam Sunday Occupy Faith and part of the Pax Christi Stations of the Cross on Good Friday and on Facebook. And the meeting was adjourned. 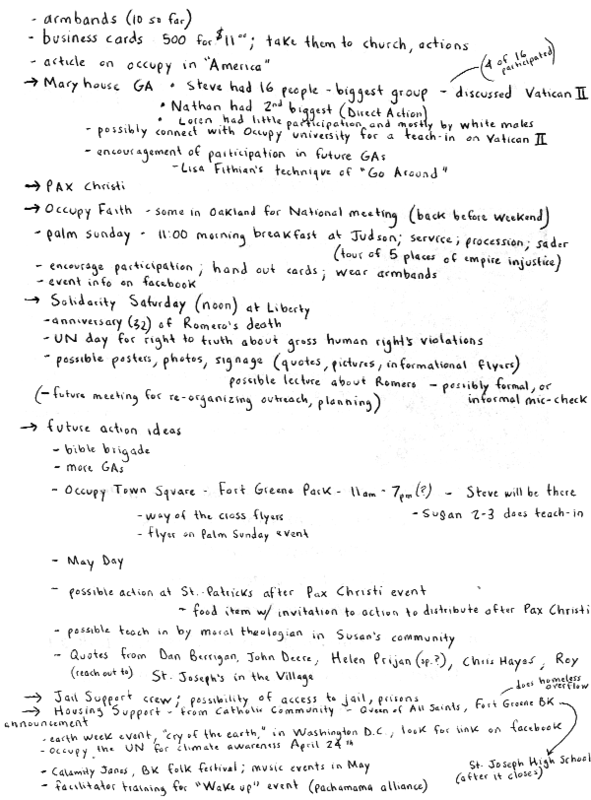 The minutes from the Occupy Catholics NYC planning meeting on March 20, 2012. Click to enlarge. Occupy Catholics Takes to the Streets! Three Occupy Catholics march with Occupy Wall Street on March 24. • Saturday, March 24, we take action with Occupy Wall Street in a massive march against police brutality throughout the city. For the first time, we will march together as a group, with OC-themed signs and attire. We will call attention to the fact that March 24 is also the anniversary of the murder of Archbishop Oscar Romero at the hands of U.S.-supported agents. We denounce repression of all kinds against those who call out for justice, especially when violence is used to silence peacemakers. We will not let the Pontius Pilates of today continue to get away without the blood on their hands being seen by all. Join with other Occupy Catholics by meeting at the big red cube across Broadway from Zuccotti Park at 11:45. The march to Union Square begins at noon. • Sunday, March 25, we will be tabling at the Occupy Town Square in Fort Greene Park, Brooklyn. Join us! • Palm Sunday, April 1, we join Occupy Faith NYC in a Palm Sunday/Passover action beginning at 11 am at Judson Memorial Church on Washington Square Park. • Our next NYC planning meeting is Tuesday, April 3 at 60 Wall St. We hope you can join us as we plan future actions and prepare for May Day! • Good Friday, April 6, we join the Pax Christi procession, followed by an Occupy Catholics action at St. Patrick’s Cathedral. As part of Pax Christi’s annual Good Friday Way of the Cross along 42nd St, Occupy Catholics will represent the 13th Station. Please join us for outreach to follow Catholic peacemakers. After the Pax Christi procession, we will lead a prayerful but visible action at St. Patrick’s Cathedral, bringing the spirit of the Occupy movement into that space on that holy day, meanwhile announcing our presence to the New York Catholic community. • Jail Support. We are eager to start a ministry of jail support for OWS arrestees, as authorities seem intent on escalating their persecution of the movement. If anyone would like to volunteer to organize this, please try to attend our April 3 planning meeting or write to occupycatholic@gmail.com. We are the 99%, made in God’s image, seeking God’s justice! City governments around the nation have driven Occupy Wall Street demonstrators into the streets—sometimes with unusual force—depriving “Occupiers” of a physical claim on ongoing protest in public space. But the movement no longer depends on privileged sites of occupation. It may be on its way to becoming something much more—a force for economic democracy, a contemporary vision of society and economic justice that has deep roots in Catholic and Protestant social ethics. It was not a coincidence that the Protestant social gospel, the modern Catholic tradition of social teaching, various socialist movements, the fields of social ethics and sociology and the ideas of social structure and social justice all arose during the 19th century. They were all cultural products of the clash between corporate capitalism and a rising trade union movement. A call for the common good and economic democracy, the social gospel was a response to the story of its time. The story of our time is that the common good has been getting hammered for 30 years. Today’s debates about busting public unions, cutting Medicaid and privatizing Medicare are the culmination of three decades of economic globalization and of massive structural, and to some degree politically engineered, inequality. Social contracts have vanished under threats of obsolescence and ruin, while the global market exploits resources, displaces communities and sets off wealth explosions in wild cycles of boom and bust. Every recent trade deal signed in Washington has resulted in well-paying jobs leaving the United States. Partly as a result of such free trade commitments, wages have been flat for 35 years and wealth inequality has accelerated dramatically. In the 1980s the United States cut the marginal tax rate from 71 percent to 28 percent and the capital gains rate from 45 percent to 20 percent. Since then the share of U.S. income held by the top 1 percent has more than doubled. The top 10 percent of the U.S. population holds more than 70 percent of the nation’s wealth; the top 1 percent alone commands an astonishing 39 percent share. Meanwhile the bottom 50 percent can claim just 2 percent. The United States needs economic democracy now more than ever. The global integration of two radically different models of growth—debt-financed consumption and production-oriented export and saving—created a wildly unstable world economy featuring asset bubbles and huge trade imbalances. During this period nearly every manufacturing-oriented society not only outperformed the United States in income growth; they did this with more equitable distribution of income. Why didn’t the United States do the same?